Red Horse is set at the beginning of the First English Civil War in 1642. The primary characters are Captain Hollie Babbitt and his young Cornet Luce Pettitt. Babbitt is a grizzled and damaged English mercenary back from the continent to fight for Parliament. 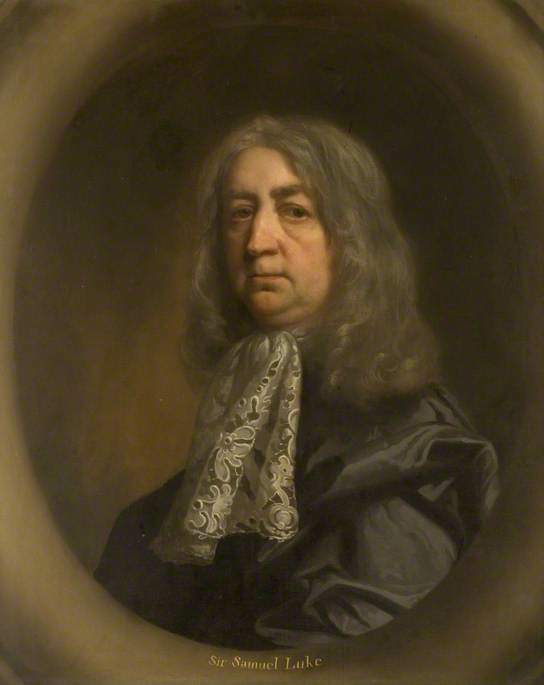 Pettitt fights from conviction and conscience, he is a distant relation to the Earl of Essex. This sets us up nicely for a tale from a cavalry viewpoint with the odd glimpse of higher command. There are a troop of supporting characters as well. For the most part they simply give enough context for the main characters not to be in isolation. Both main characters are flawed, and this makes their character development engaging. Luce starts off naive and relatively innocent. I could identify my long departed 20-year-old self with him (although I didn’t write poetry back then, nor did I have Luce’s prudishness). Babbitt is suffering from mild PTSD, he has flashbacks and mood swings. After the battle of Edgehill he loses touch with reality and gets suicidal. Fortunately for him people are looking out for him. As well as the characters being real and engaging there is a really good level of historical accuracy in here. The author clearly knows the period that she is writing about. I’ve spent a couple of decades reading about and re enacting the ECW. There were only a couple of minor points I noticed, and both made Red Horse more readable for people not steeped in the history. The full richness of the period is shown in Red Horse. With Parliamentarians you get the different levels of motivation. There are religious dissenters, raving preachers and quiet Grindletonians. There are also well off types that fight for liberty, their liberty and not really that of the common man. On top of that there are the British mercenaries that have learnt their trade in Europe and come home for pay. It’s not all military either. Befitting the nature of the civil wars there are interludes where we see the impact on civilians. In fact the military bits are only because of the wider context, Red Horse is more social in nature and how the protagonists deal with both the war and their lives. Overall I loved Red Horse. I paid for it myself and as soon as I finished it I paid for the sequel, Command the Raven. I think you should read it too. I was fortunate enough to be one of the select few speaking at the English Civil War Living History Symposium at Pitchford Hall this weekend. There were several fascinating talks all aimed at deepening our understanding of 17th century life and also how we deliver Living History events. My thanks to Sue Sampson who organised the Symposium and to Ken Clayton who marshalled the speakers in the hall. These were mostly hands-on practical activities. I spent most of my time in Pitchford Hall itself as that was where I was presenting. So I heard the Stuart Peachy talk on food, Ken Clayton’s talk on research, Steve Southcoat on the importance of Living History and Carolyn Richardson on the Lute. Over on the campsite I saw a little of David Best demonstrating blacksmithing, and talked more with some of the participants. Stuart Peachy is well known amongst the living history community as an experimental archaeologist. That’s to say he takes what he reads and gives it a go to understand it better. So his talk was a mix of what the period sources tell us and the results of his experience with preserving food. I missed the start, but came in to the discussion on pig husbandry. Pigs being a mechanism for turning food waste back into food. Think of it as an early form of recycling and waste reduction. The practical point of this is that pig husbandry practice was different in the 17th century than the early 21st. Today we produce food for pigs so we can make lots of pork products. Back then they only kept enough pigs to consume the waste they produced. Out of each litter the weakest few would be killed immediately, of the five allowed to suckle two would become suckling pig to be consumed as a delicacy for the gentry. The remaining would be kept while there was food and then slaughtered and preserved over a month or two. The offal would be used fresh and the rest salted or smoked. There was loads more on traditional meat products and who are them and when they tended to be available. Enough to keep dozens of blog posts full to the brim. This second post in the living history series is on creating good living history characters. The previous blog post was on the five steps for scripting living history events, of which creating your living history characters is the fifth step. Living history events are a sort of promenade theatre with a lot of improvisation. Re-enactors are often mingled with the public, and many will be answering questions one to one. So living history characters need to be more robust than if you were writing for another medium. There are of course a whole load of other options on top of those. You just need to pick one. Also the objection could be from the parents of either party and not from the lovers (think Romeo & Juliet). Either way we’re going to have a parish court involved to help remove the obstacle (or provide a solution). The first thing you need is to understand what characters you need. Our primary living history characters will be the young woman, and her lover. We’ll also need members for a parish court, at the least a constable and a couple of elders. We’ll also need some witnesses to give ‘evidence’. You might want to draw a relationship diagram with your list of characters. Especially you need to work out where the conflict arises and who knows what. They both need to have details on their relationship and social position within the village/town. Both need an objective, if they wish to marry then there should be an obstacle for the court to overcome. Conflict is what drives stories, so this needs to be there. A parish court looking into this will also have a constable and a couple of elders to hear the case. These are recurring main characters, they can be involved in many scenarios. They also need a bit of background. Who are they and what are their responsibilities on the parish court. What is the due process and where are the limits of the decisions they can make. There will also be a need for witnesses, the parents of the young woman at the very least. Depending on the tack you take there may be another candidate for paternity, or a reason why the lover cannot marry the young woman. All of the witnesses need a few lines on what they believe they know as facts in the case. They might also have a motivation for giving evidence. If in doubt, be quiet or say that you do not recall. The most believable characters are well rounded. Each person should, at the very least, know their age, occupation and connection to the scenario. It works best if people play someone analogous to their modern self. It has been quite a while since I was last involved in scripting living history for an event. It has also been a while since I attended one, but I spent this weekend at the ECWS living history site at Newport Pagnell. The ECWS living history has come on a long way over the last few years. There is an excellent small town feel to it with a load of talented people showing a wide range of skills and aspects of 17th century life. This is how it should be. The thing about scripting living history is that you have to make sure there’s a realistic historical perspective. You also tend not to have much, if any, rehearsal time. The cast are usually volunteer members of a reenactment society. My regiment only meets up at events and you can’t be sure exactly who will be there. There’s also a need to make it flow, and capable of dealing with unexpected interjections. Often you want a bit if audience participation, the aim is to engage people with appropriate history. The best way around this is to keep the script light and make the players improvise around a theme. The key purpose of scripting living history is to engage people with history and give them insights into life in the past. Most of the reenactors do living history so that they can better understand the period they depict. Having kit, reading books and putting on a display goes so far. Scripting living history takes it a step further. The key question is – What do you want to learn about? It sounds obvious, but if you are going to set up living history scenarios then you need to read and understand the actual history. Don’t work off what you imagine might have happened. Find some real first person accounts of the thing you are interested in. When I was researching the parish courts I got some books about the subject, including some period manuals for parish officers and justices of the peace. I also read a load of parish records summarising cases dealt with in West Yorkshire (because they’d been transcribed online). This gave me a rich vein to work with. It also helps when explaining to the public, if you can say ‘this actually happened’ and give them a location and date. You go from entertainment to education with that one step. Once you know the history it is time to actually write your script. For these events it is helpful to have some general background for the reenactors to share before the event. However don’t publish the whole script, or even any details. The background brief should completely fit on one piece of A4 paper in 12 point text with one inch margins. If it is longer than that no-one will read it properly. More to the point they won’t remember it. The purpose of the brief is twofold. One is to ensure that all members of your group understand what is likely to happen. The other is to seek volunteers for the roles that you need. You should try and circulate this several weeks ahead of the event, and follow up a week ahead. At this point no-one has any details of the script nor of the scenarios. This is important. This helps people form their character’s memories with historical context. In 1638 a 45 year old might just remember the old Queen dying and the Scottish King coming south. They’ll certainly remember the coronation of King Charles I. A 15 year old wouldn’t remember either, other than from the stories they’d been told. We usually do events set in the midst of the British civil wars, so it is useful for people to have an understanding of recent events that the people at the time would have known about. It makes it much easier for knowledgeable reenactors to stay in first person roles. A useful step for people is to write their age at the time of the event next to the timeline. E.g. I am 44, at a 1638 event I would have been 31 for King Charles I’s coronation, and old enough to remember his father’s coronation too. If the event was 1648 then I would only have been 21 and wouldn’t even have been born when James I was crowned. Each role needs a personalised briefing. The level of detail depends on how key the role is. For the primary roles you want a bit of back story as well as grounding in the lead up to the start of the scenario. You should also set them an objective to seek from the scenario. This is the hardest part of scripting living history, so more on this in the next part. I spent the weekend laying siege to Bolsover Castle as part of the 17th century Army of Parliament. It was a lot of fun, and quite a busy couple of days. The best bit though was definitely seeing lots of old friends again. Shortly after the battle of Marston Moor in July 1644 Bolsover Castle was attacked by the Army of Parliament under Major General Crawford. We were re-enacting that over the weekend. 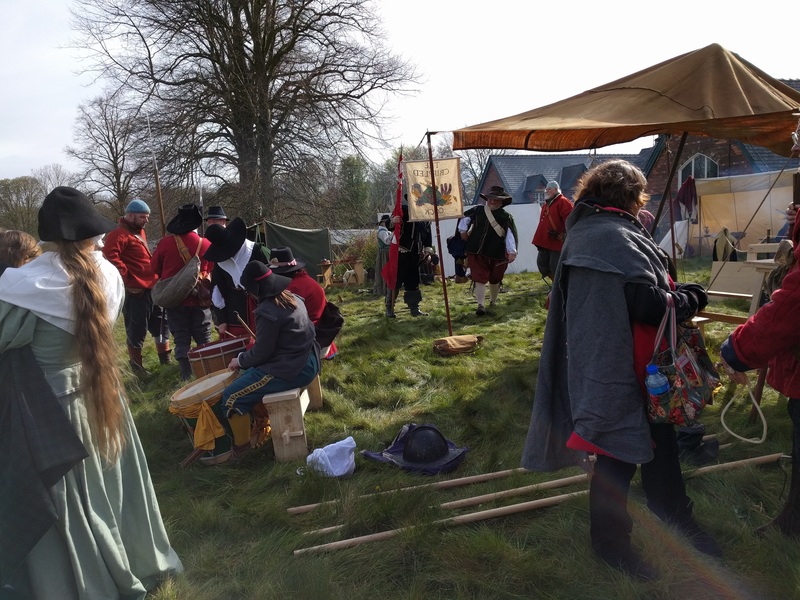 With a mixed group of the Fairfax Battalia and the Sealed Knot we put on a creditable show. There were three regiments present (about a company’s worth of soldiers in each). The Earl of Newcastle’s regiment from the Sealed Knot provided some white coated and blue bonneted defenders in the extemporised filed works outside the castle. There were also four exquisitely armoured cuirassier in support. On the outside there was a blue regiment lead by Sir George Lisle‘s Regiment from the SK with blue coated friends to make up about 50 soldiers all told. There was also a red regiment styled as Devereux’s (one of the constituent units of the Fairfax Battalia and the event organisers). I was with that unit and it was a fifty fifty mix of Fairfaxers and SK. We gelled really well and it took only a short drill session to harmonise our postures and methods. The attackers also had a siege mortar and six horse in support. As well as the military side there were two living history encampments at Bolsover Castle. One inside and one outside. The attackers had a real family feel to it, with a fair number of children getting involved, six of whom were pre-school. On both of the event days we ran three sessions for children to learn about being civil war soldiers. Equipped with wooden muskets or short likes, visiting children did musket and like drill. I helped with one and lead three more of these sessions. We taught the kids the principles of drill, forming up, coordinating movement and how to move the musket and pike. For those doing pike we taught them how to fire by ranks, salvee and attacking with clubbed musket. For the pike they charged for horse and also advanced at the charge. This lead into concluding with a joint attack on the crowd line after a salvee. We finished by saluting the crowd. The kids seemed to enjoy it and some came back for more than one go, we ran two iterations each time. On both days we had the same script for out siege and assault on Bolsover Castle. In the early one we were rebuffed and we brought in a siege mortar for support and were chased away by the cuirassier. In the later battle we also had horse and grenadiers so took the outer work. The garrison then negotiated a surrender and marched out. All in line with the history. As a reenactor it was a busy weekend, especially on the Sunday. On Saturday I arrived at lunchtime at the campsite, about a mile from the castle. After sorting out my sleeping arrangements I went up to the castle to help unload the van and set up camp. That took almost three hours, followed by dinner and a walk back to the campsite. On Sunday, we formed for drill and a walkthrough at 8am that lasted for two hours. We then had a brief break before the public arrived. I helped with children’s drill at 11. Powder issue at 12 followed by lunch and more children’s drill at 1pm. Then getting sorted out for the battle at 2pm. I had a breather for about an hour, although collected more powder and match, and a second battle at 4pm. We returned the remaining powder (I fired ten shots between two battles) and finished just after five. Then it was back to the campsite for musket cleaning and washing up. Monday had a later start because we didn’t have to reps the walkthrough. We did drill at ten, then an actual drill display at 11. We hadn’t been expecting the 11am display, so there was a rushed powder issue. We fired three times for the crowd. After that I did children’s drill at 1pm and 3pm. We also attempted a battle at 2pm but it got washed out in a torrential downpour. The audience visibly ran when it came on. We just stood and watched, I tucked my hand with the match under my cloak. It was so wet that almost no-one fired first time, many had their match extinguished by the rain. The rain got into my priming pan and turned the contents to porridge when I tried to fire. Luckily the rain slackened and I managed to clear it and re-prime. The second attempt worked. Being one of the few with lit match I helped the others fire their charges. This needed a couple of manual ignitions after pricking the pan. We went back out and tried again half an hour later, after the rain slackened off. Things were difficult, a lot of match had got damp and wouldn’t stay lit, including mine. I managed to swap with some spare match another musketeer was carrying in her bag. There were several misfires, nearly all damp priming pan related. That said I got six shots in, and finished the priming flask. After the battle I gave my musket a liberal dousing in WD40. The WD40 helped dry out the gun, but it made my priming pan cover too smooth. Every time I loaded the musket I lost the primer. So I had to reverse my loading order to prime last. This is a bit more dangerous as there is always the chance of a spark hitting the priming pan when you are filling it. You fill it first so that you only get a flash in the pan rather than a full on negligent discharge. It worked for me though. I got through several shots, most of them double charged just to make sure there was enough powder to clear the barrel. I was a bit worried that some would stick to the wet sides as I was loading. After the second battle I left for home, we had over four hours of travelling and two children to get to bed at a reasonable time. As it was we only got home at ten. It was a fabulous weekend and lovely to see people again. I’ve remembered why I love this hobby and plan to be out in a warm wool coat later on this summer! The Last Roundhead is the best historical fiction I have read in years! This is the tale of Blandford Candy, the last roundhead alive in 1719 when he wrote his memoirs. In the long hot summer of 1642 he is forced to leave home because his sister has discovered that he is having an affair with his eldest brother’s wife to be. He rides up to London in search of fame and fortune, just in time to be enlisted in his uncle’s Regiment. It is by far the best historical fiction that I have read since I finished reading the Flashman papers. Laid out in the style of the Flashman papers, Candy’s story is very well researched and thoroughly end noted. The history is part of the story and doesn’t get in the way, it all makes sense without reading the end notes (although if you do you will learn about mid seventeenth century England). Blandford Candy is not Flashman, his character is wholly different. For a start he lacks the bully boy swagger and cowardice of Flashman, although like Flashman he often gets involved in things that he would not have done otherwise, and he’s lead by lust more than brains. He does have brains though, and they get him out of some of the scrapes along with a measure of luck. Candy is an unreliable narrator from a period where truth and accuracy were seen as perspectives rather than necessities in journalism. The chapters in the book are interspersed with correspondence and news pamphlets from the time, giving us other perspectives than just Candy’s. Like many of his time he is sophisticated in his cynicism of the printed material. He is the third son of a middling family. Candy has been brought up as a gentleman, but also has an understanding that there will be no inheritance for him. The social position leads him falling naturally into being a young officer in his uncle Samuel Luke’s cavalry troop. This takes him to Edgehill, where his flamboyant red hat marks him out for special attention in the melee with Prince Rupert’s cavalry. Barely surviving the initial clash he recovers his composure and is able to participate later in the breaking of the King’s infantry, where he kills a red-headed ensign and takes the colour. Back in London he becomes one of the 24 scouts when Parliament appoints Samuel Luke as Scoutmaster General. This leads to a whole load of skulduggery and plotting as well as a raid to uncover the printing press producing pamphlets for the royalists in London. He also goes to Oxford over the winter with the peace commissioners where he meets his middle brother, recently knighted by the King for loyal service. There’s a whole load of hidden plot here that develops through the rest of the story. We see Blandford Candy being transformed from an innocent young man driven more by libido than anything else into a hardened warrior, confirmed roundhead and cynical agent for Parliament. He also develops close friendships with the other scouts, and there are moments of tragedy when some of them die, whether from disease or enemy action. There’s a lot of promise for more in the book too, references to other events and interesting characters, including Rochester. I certainly hope that there are as least as many of these as there were of the Flashman papers. The book is available for pre-order, and is on general release from 1 August. Jemahl Evans kindly sent me an advanced reading copy knowing that I was a book reviewer and a member of the English Civil War Society. The Last Roundhead has exceeded my expectations and I would thoroughly recommend it to anyone that enjoys history, thrillers, spy stories or mysteries, because it has all of these wrapped in together.